Panel session: “A tale of two libraries: adapting outdated buildings for a sustainable future”. As previously mentioned, the University of Oslo Humanities and Social Sciences Library is in the process of planning and applying for funding for an extensive renovation of the first and lower level floors of the library in Georg Sverdrups Hus. Furthermore, an extensive technical upgrade of the interdisciplinary Undergraduate Library at Sophus Bugges Hus is already underway. I therefore wanted to hear what Margaret Bean (Head of Science Libraries, University of Oregon) and Jill McKinstry (former director of the Odegaard Undergraduate Library, University of Washington) had to say about the renovation and updating of their respective libraries. Architecht Becca Cavell (Fellow of the American Institute of Architects), joined them for a panel session, and between the three of them they touched on all the stages of a renovation project; needs assessment, the planning and funding process, and the construction and reopening stages. Both libraries are housed in robust midcentury buildings (I believe the term “brutalist architecture” came up once or twice), and both had to be modified rather than replaced. As one of the speakers stated, “the most sustainable building is the one you already have”. Both universities are also flagship universities of their state, so there was a certain standard to be upheld. Needs assessment: one of the reasons for the renovation of the Odegaard Undergraduate Library at the University of Washington (UW) was, according to Jill McKinstry, the ever-increasing demand for more study spaces, more team spaces (makerspaces) and more flexible study areas. This was a common denominator for both projects (and ours). They wanted light and openness, and the architects focused on “the space in between” the more stationary areas. They also focused on the need for a variety of spaces, some quiet, and some collaborative. The UW library building was constructed in the early seventies, and what they really wanted now was a “high-speed, high style, limited budget makeover”. Recently completed, they managed to stay within the expected time frame of 22 months due to a considerable team effort. At the University of Oregon campus, the Price Science Commons and Research Library (UO) had much the same needs for new and more flexible learning spaces. In spite of being located in a building that was, in Margarets words, “unattractive and uninspiring”, they have had an extraordinary 72 % increase in users, “who all seemed to be in the library at the same time”. However, they also needed to fix a leaky ceiling, and, being located in the basement with no visible entry from the outside and no natural light, they needed a new, visible entrance. They also wanted to spruce up their sunken courtyard, since it was “dark, dirty, and only good for stepping outside to get cellphone reception – as there was none inside”. Funding process: When they applied for funding to upgrade the Odegaard (UW) library, the concept that Jill believes “sold” the project successfully to the funding agencies was “enhancing learning spaces” (also a central concept in the GSH application). They also stated that they wanted to improve both formal and informal learning spaces. After considerable effort, they received a 16.575 million dollar grant to redo their 43-year-old building. At the UO Science Library they recieved a pledge of 9 million dollars from a generous private donor to redo the library, after he had taken a tour of it. The donation has subsequently been matched with a 9 million dollar grant from the state, and construction is now underway with hopes of completion in July 2016, nine years after the first donation. Planning and construction: Dialogue is key in large renovation projects. They involve many stakeholders: library management and staff, university administration, funding agencies, students and faculty, and of course the architects, construction companies, and so on. For the Odegaard (UW) project they developed a set of Planning principles of shared vision for Odegaard: they wanted the library to be “future-oriented, student-focused, integrated and partnership driven, and information driven”. The planners worked extensively with their IT department, which was vital to the success of the project. Jill’s advise was to talk about your problems and challenges rather than what you want, as it makes for a more rewarding dialogue. They went to conferences together with the arcitechts, they looked at other projects, used webinairs etc. and in 2012 they moved into trailers behind the building, with the construction people and the architechts in trailers nextdoor, easily accessible. In addition, they moved all offices off the first floor (freeing up yet more space for students), and glassed in the whole third floor study area, making it super quiet. They added a 350 computer learning lab, and glass sliding doors and writable glass walls to the active learning classrooms. Smaller tables and movable chairs gave them more flexible spaces. By the way: the color scheme of the new UW library is white and grey, with splashes of orange. No, excuse me, “Poppy”. As Jill pointed out, ”Orange” is hopelessly outdated in a 70’s kind of way, while Poppy is all the rage. Whatever, dude. At the science library in Eugene (UO), they asked the students and faculty what they wanted from their new and improved library, and what they wanted was more flexible space, a new visible and attractive upstairs entrance, and visual branding as a science building. The undergraduates wanted cellphone coverage and a cafè. With free coffee. The graduate students were adamant about keeping the book collection. And they wanted a cafè. The faculty wanted improved classrooms. And a cafè. With quality coffee. The library had to reduce the footprint of the physical collecton, and made the critical decision to cut their collections in half. Through aggressive weeding. In one year. They replaced their printed journals with online resources, and print-only sources were moved to the math library (located nearby) . They also decided to remain on site during construction. The cost of moving was too large, and there was nowhere else to go. Teaching faculty helped in the design of classrooms, makerspaces, and quiet spaces, and they developed subject specific department rooms for each science department, tailored to the students and faculty. The planners added an energy-efficient glass wall entrance, which is sunscreened by the use of aluminum mesh – showing the dna sequence of the zebrafish. They are also planning to beautify the atrium downstairs with outside tables and chairs, and adding Wifi access throughout. The UO project has environmental concerns high up on their list. They are cutting the number of entry doors in half, and are glassing them in, creating a vestibule. This will save energy on heating, and work as noise containment. There will be extensive use of LED lighting, and they will reuse water. At the UO library they are including both staff and users in the project by using surveys, and by putting up posters for the students in the foyer of the library, asking them to comment. There will be a Café. Both libraries have used renovation blogs to keep people updated. 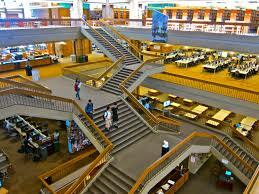 Reopening: UW created wayfinding guides for the reopening of the library. However, the students seemed to find their way around themselves, and there were very few complaints. Additional resources: I finally found a photostream of the Odegaard (University of Washington) renovation, it shows the magnitude of the project. Check it out! 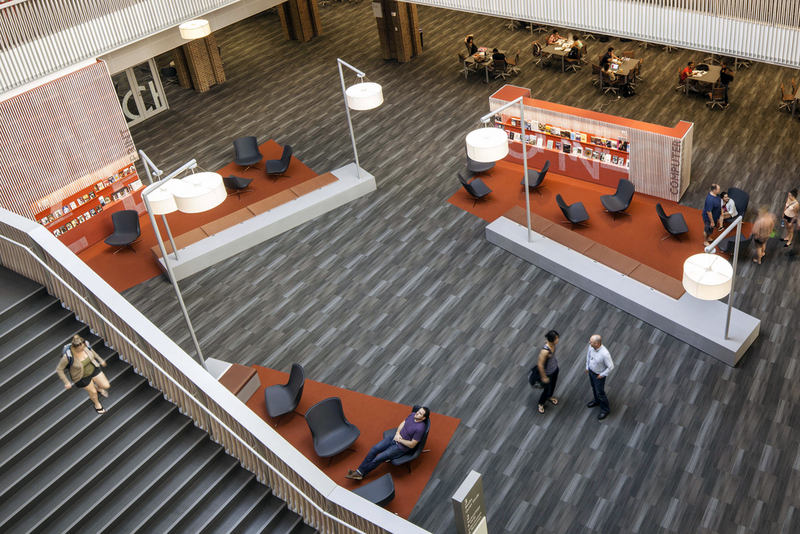 The American Library Association (ALA) and Association of College and Research Libraries (ACRL) has put together a resource page for planning of academic library building design. This entry was posted in ACRL2015, Library Renovation, Uncategorized and tagged GSH, Library renovation, Odegaard, UBO. Bookmark the permalink.